Rainbow lorikeets are brightly coloured birds which are native to Australia. Although not native to Tasmania, they are a colourful addition to the Tasmanian environment. 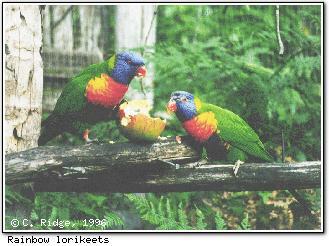 Lorikeets eat fruit and berries, and can occasionally be seen in suburban gardens.